The school offers a comfortable transportation not only from all the major areas in the city but also from nearby areas. 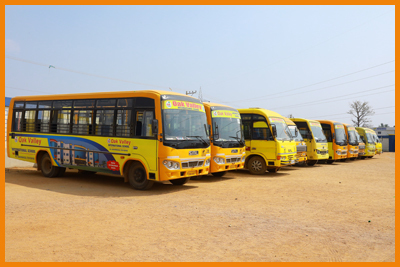 The buses with clear, comfortable scaling, trained drivers and lady attendants ensure safe travel of our children. The students are expected to be disciplined in the bus. They should willingly accommodate the students of a particular route. It is also expected that the juniors be treated with love and affection by the seniors and faculty – students are strictly instructed to communicate in English even in the bus.